This past Friday I decided to put my custom orders aside and do my own thing. 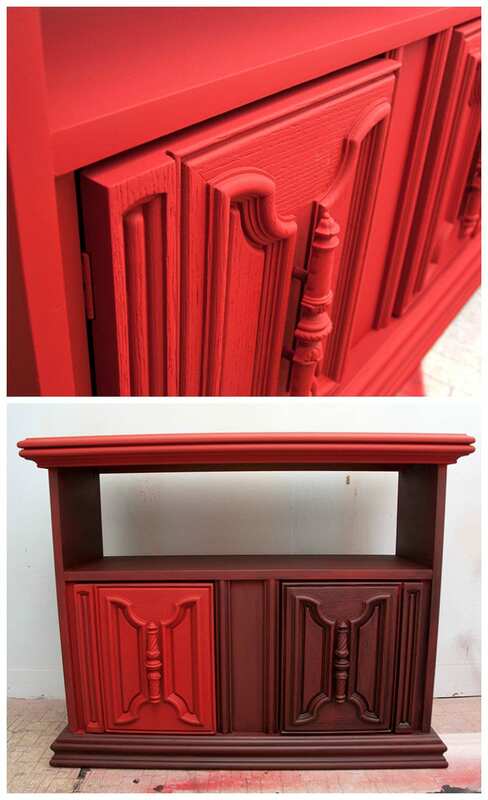 I felt a ‘creative-calling’ to Paint the Town Red by SPRAYING Annie Sloan Emperor’s Silk Chalk Paint. Although there’s a TON of on-line articles/reviews on the benefits of painting w ASCP (Annie Sloan Chalk Paint), there is limited information on how to use this fabulous paint with a spray gun. I mean, everyone claims this paint can be used in ALL applications …right? So what’s the deal with so very few people spraying chalk paint to get that flawless spray finish? The answer is <<<F-E-A-R>>> my friends! And I speak from experience because I was feeling it! Recommended spray gun tip: at least 1.8mm to 2mm…. Not very encouraging… but I still had to give it a try. Now, if you’re anything like me, you’re very attached to your spray gun or spraying unit. You treat it with love and would NEVER put it in harms way…am I right?! Well Chalk Paint is super thick and dries super fast… two (2) ‘not-so-great’ points when trying to keep your sprayer’s best interest at hand! So here’s how it all went down on the 2 small thrift finds I decided to experiment with. I poured the ASCP into my cup without watering the paint down. My logic was; if the gun wasn’t going to spray properly, I could always add a little water afterwards. NO WATER or THINNING OF THE PAINT WAS NECESSARY! My 1.4mm tip sprayed the chalk paint beautifully. Below is a picture of how thick it looked in the paint cup and what my wall test looked like. Yes, I use my walls to test spray. That’s the beauty of having a designated paint room where anything goes. I’m hoping my entire studio will eventually look like a Jackson Pollock original. A highfalutin Art Dealer will spot my creation on-line and offer me a huge fortune for a piece of my drywall… it could happen! During my test sprays, (which my sister claims ‘ruined’ my Jackson Pollock and made my studio look like the Devil’s Den) I discovered 2 things. 1. To spray chalk paint, my Spray Gun requires the maximum operating pressure (40 PSI for the Husky HVLP) with the fluid control knob set to the max. I also adjusted the pattern control knob to a denser circular pattern rather than a wide spray. Why? When I tried painting with a wide spray, all it did was spit. 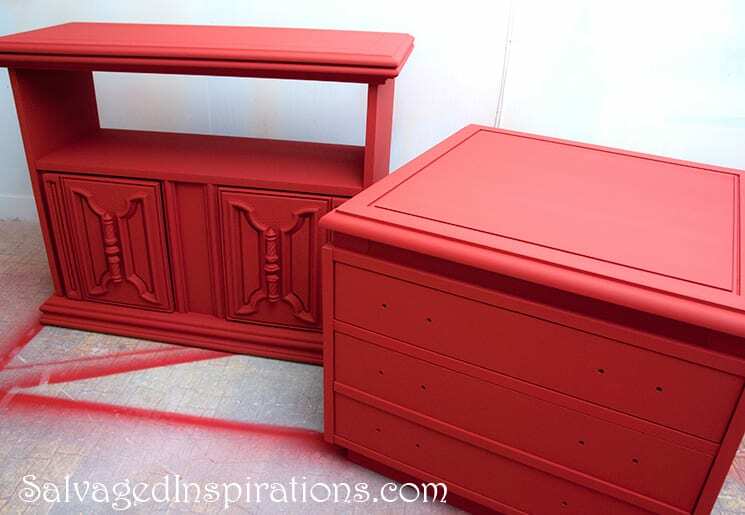 I’m sure every sprayer will be a little different, so play and test before spray painting your furniture! 2. I’m accustomed to NOT wearing a spray mask when working with ASCP. I forgot to put one on. (My Smarticles weren’t working on Friday.) Big mistake! I should know better when working with a sprayer. Just because this paint has no VOC’s, is eco-friendly, and has natural components does NOT mean it’s safe to inhale the fine mist particles. Protect yourself!! Here’s what they looked like completely dry. To complete these 2 tables, I sprayed 2 coats for full coverage. This used 2/3 of a quart of Annie Sloan Chalk Paint. So how did it all turn out? Spray painting the 2 pieces was quick and easy. I LOVED that it dries super fast. The chalk paint is dry and ready for the 2nd coat in about 20-30 minutes! 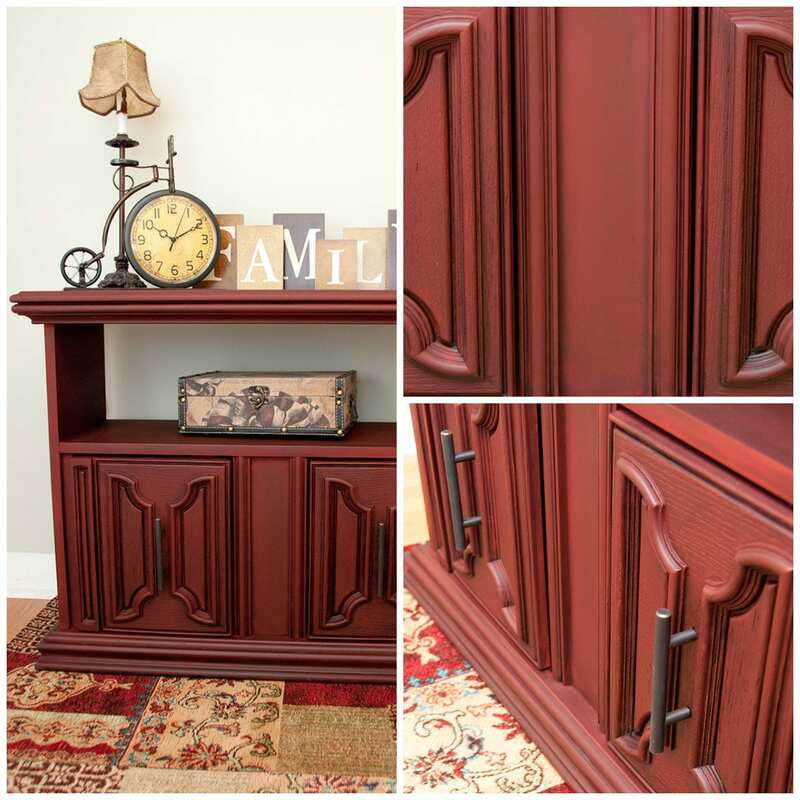 I finished the Traditional Credenza with an Ebony Minwax Stain rubbed in areas to leave the red peeking through. The Asian Inspired Table below was left au’natural Emperor’s Silk; two totally different looks using the same colour paint. For my Asian Inspired Table I left the Emperor’s Silk in all its glory and top coated it with a soft sheen of wax. Here is the before and after and some close-ups of the sprayed finish. So here’s proof spraying Annie Sloan Chalk Paint is not only possible, but produces a flawless gorgeous finish! Overall, it was a very good experience with exceptional results! My biggest complaint would be the clean-up. Cleaning my spray gun was NOT fun. I was expecting easy-peasy…. just the way it is when I clean my brushes after using ASCP… but no such luck. To get the spray gun perfectly clean, paint thinners were a must and the cleaning process was frustrating. So here are my views in a nut shell. If you have any tips, suggestions or questions, chime in… I’d love to hear from you! If you’re my night-in-shining-art-dealer…call me! Hi love the finish of the cabinet I’m planing to spray out my daughters furniture using the husky sprayer.I was woundering if you changed any settings since spraying with ASCP are you still using it non diluted .and using the 1.4 tip. Thank you for your reply.what air pressure do you find that works well with ASCP. with the 1.4 tip. 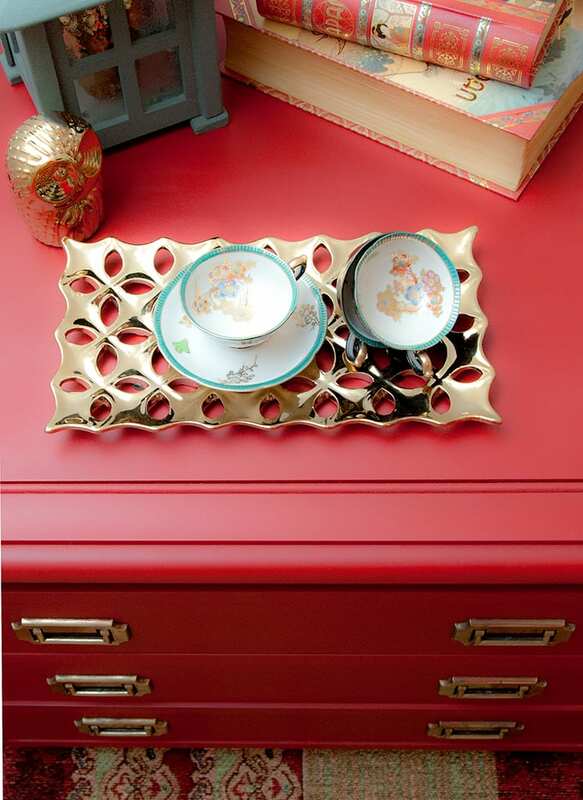 Did you use the Annie Sloane wax for the Asian Inspired dresser? I am going to be painting my daughters furniture this weekend and am most nervous about screwing it up with the wax part. I want something that will protect it and give it a nice sheen – not crazy about the matte look unless done just right. Should I use a different type of protective coating? Hi Meghan! Yes, I did use Annie Sloane Clear Wax for the Asian Inspired piece. It’s kind of hard to screw up wax unless too much is applied. I like to work in smaller sections with smaller amounts of wax (for instance just the top of the Asian piece), rub it all in and then move on to the next area. If you want more of a sheen, buff again in 24 hours. 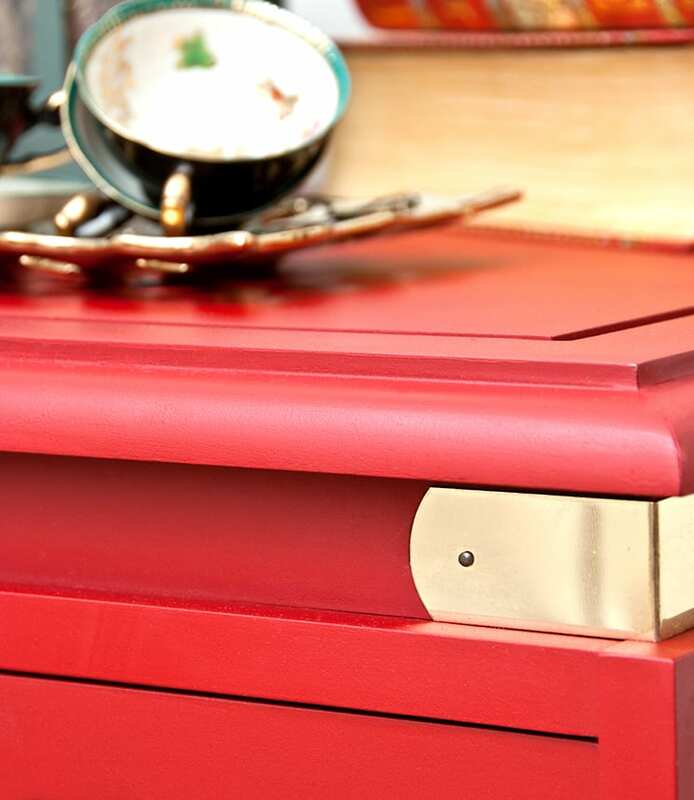 You could also use a poly finish in satin or gloss if that’s more the look your after. This information is very helpful! I am hoping to paint my kitchen cabinets…there are a bunch and I plan to use a sprayer. Do you think if I sprayed Annie Sloan’s chalk paint, and then sprayed a clear coat of varnish (not wax), that this process would be durable enough to prevent chipping paint? I need a strong finish. Enamel would probably be the best option, but so much prep work in removing varnish and sanding! Thanks in advance for your help! Test first AT. 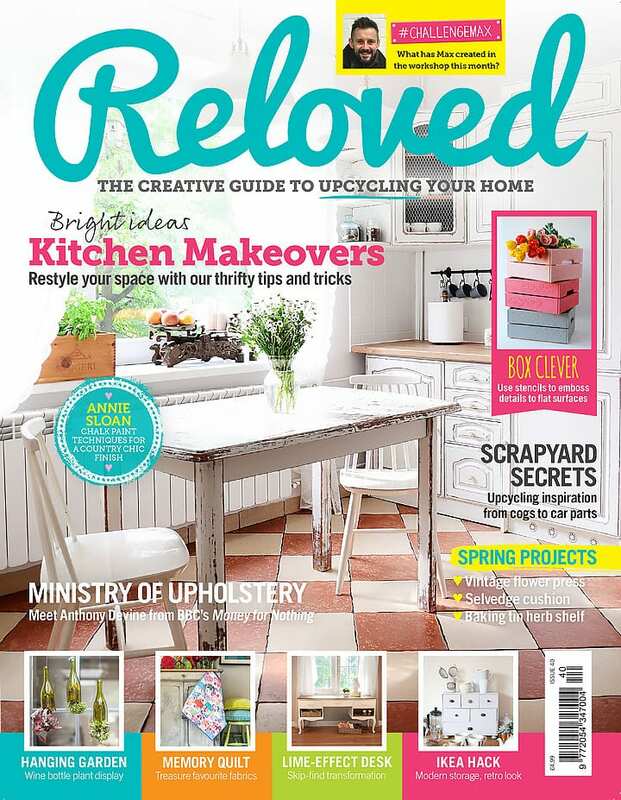 For high traffic kitchen cabinet, I would suggest a light sanding (at the very least) even when using chalk paint. And I agree, Enamel paint would be super durable. I’ve redone two kitchens using ASCP and it works great. I clean the cabinets of any grease then apply two coats of paint followed by two coats of a water based satin polyurethane. 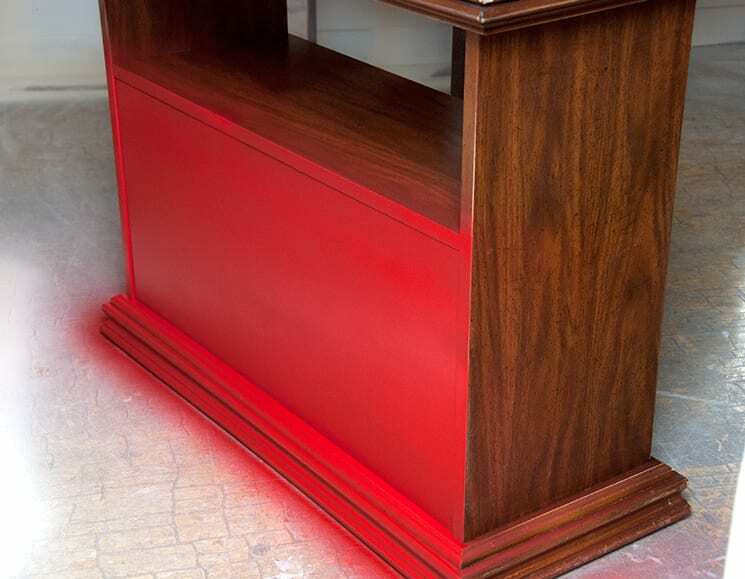 Have you spray painted any furniture and still be able to see the grain underneath? I have a dining room set and bedroom furniture that we want to keep the grain visible. The red looks very beautiful and luxurious. What type of sprayer do you have. I have never used one so don’t even know where to begin. Lightweight would work for me. This is my paint gun Susan. Hi, I was just wondering if you ever sprayed diy chalk paint? Your blog and tips are so helpful. I am interested in painting my column radiator. I feel painting this by brush would be too time consuming. I wondered if a water based eggshell paint will be alright to use in a sprayer? A water based eggshell paint works perfectly well in a sprayer Jenny. And if you find it’s a little thick you can always thin slightly with water. However, I would double check that a latex is safe to use on a column radiator. A better option may be a paint specific for metals and that can endure heat. No disrespect to the great Annie Sloan, but I am madly in love with Americana decor chalky finish paint and Folk Art Home decor chalk paint. I can get them at Home Depot, Joanns and Michales. Great expansive color pallet and at $5-$6 for 8 oz you can’t go wrong. I also love their waxes they are like conditioner consistency. I have used them with a paint sprayer BUT always watered down. They thin out nicely. I always have added a tiny bit of water because it cuts down on brush strokes. I am going to try your adjustments and see if i can spray with out adding water. I fully agree clean up is a BEAST!!!! Have you tried these paints? 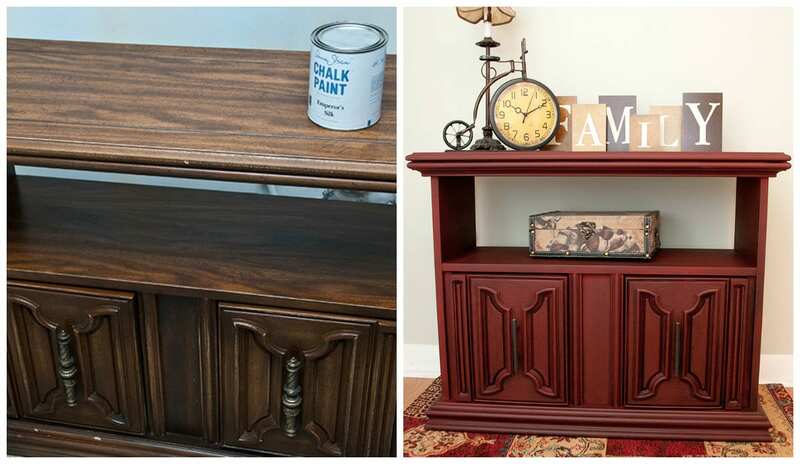 Curious on your thoughts considering you use several paint products to refinish furniture. Love your posts chalk painting is my fave hobby. Hi Kelly! I haven’t tied FolkArt or Americana but I’ve heard great reviews. I’m going to give them a go. And how convenient that they are sold at HomeDepot…my home away from home. I guess it depends on the spray-gun re the adjustments but thinning with water is always a safe bet. 🙂 Hey, you are HILARIOUS… thanks for the laughs! I dropped by to check out your vid clip on NickMom Night Out… you are GOOOOOD!!! I know this is an older post, but Kelly struck on a subject I have been researching for days…. Is it possible to use the HomeDecor wax (the really creamy stuff – I guess it is about the consistency of hair conditioner) in a spray gun. I have a Critter gun and have been thinking of trying it. I will probably water it down about 3 to 1. Unless anyone else has tried it and can share some tips…. Hi Nicci! Your best bet might be to contact Plaid (the manufacturer) to ask this question – but my guess would be no. Wax products and water don’t mix well. Also, applying wax by hand (cloth or brush) rubs the wax into the piece vs spraying the wax on to have it ‘sit’ on the surface. If anyone else reading this has any experience with/or anything to add – feel free to chime in! Just love this site thank you for the information you give,it is so helpful and so given with so much thought. Thank You for all this great info!! I am in the process of painting my daughter’s bedroom furniture with HMCP, and it is taking forever. I found your site today and was so excited I ran out and bought a Husky HVLP! Had wanted a Graco Airless but they are too much of an investment for a “first” paint sprayer. I have it all set up and ready to go! I have an airbrush so I understand the takes forever cleaning process. Do you have any tips for cleaning the Husky HVLP after using chalk paint? Thank you for all the beautiful inspiration pieces! Yes, time and patience…lol! If you clean your paint gun immediately after spraying it’s not that bad. I try not to use chemicals to clean when I’m using water based paints, however if you find your gun is not 100% clean, you can always run some paint thinner, mineral spirits through it. Good luck with your project Kelley… I’m sure your daughters going to love it! Thanks so much for this tutorial. I just found your post on Pinterest as I have recently purchased a sprayer and you are right…not much out there about spraying with ASCP. So thank you! Question for you…have you ever sprayed a clear coat? If so, did you get the results you wanted? Thanks again. Your pieces turned out beautifully. I just found your blog and love it~! I have a Wagner Flexio 590 Sprayer and am wondering if that would work with chalk paint. I love all of your pieces, they look so professional! Thanks Fanny! And yes, I don’t see why your Flexio wouldn’t work with Chalk Paint. But just like with ANY sprayer or spray gun, testing before spraying your project is a great idea. With your particular sprayer, the paint may or may not need a little thinning. Have fun! Love the red color! You has done a perfect job with your paint sprayer! The color contrast does impress me. Thank you for this post. I love your post and excellent pictures. 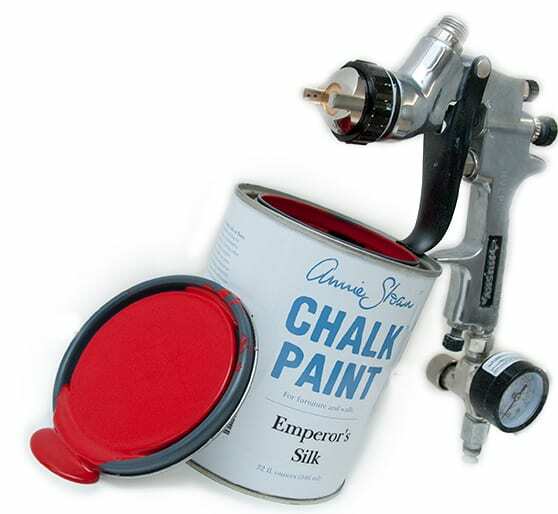 It is the most detailed post on spraying chalk paints that I have found. I know I need a compressor, but I would like to get the smallest I can. I tried lifting the handle of one at the store the other day, to see how easy it was to wheel, I couldn’t lift the handle! ugh. I don’t know anything about compressors, so any info and advice would be greatly appreciated. Also, have you tried any of the Shabby Paints? Thank you for the tutorial. I have been thinking of buying a sprayer and feel so confused on which one to buy. I have been doing ALL my pieces with paint brushes and REALLY need to do the sprayer to do my chairs and detailed pieces (I did 2 and called it quits…so time consuming 🙂 ). Do you do most of your furniture by brush or sprayer? 50/50 Dana… I really enjoy spraying and hand painting my pieces. For chairs… spraying is waaaay easier! Working on kitchen cabinets with ascp in paris grey. Tryed brushing but decided it wasn’t the look I wanted. Came across your blog and photo’s which were beautiful. I have been wanting a spray gun, so this became a win win shopping trip. Husband wanted to upgrade his compressor and I wanted a spray gun. So I’m spraying cabinet doors tomorrow!! How exciting Kathi! Wishing you all the best with your kitchen cabinets… I bet they’ll be gorgeous! Just came across your blog and the timing could not have been better. A couple of months ago I was all set to spray my pieces with ASCP when I read it could damage my spray gun. I never started the project and went onto something else. Now I am ready to start and luckily found your blog. Thank you for the great information. how much do you feel you have to spend to get a decent paint sprayer? Do you have a make and model you recommend ? I grew up with my parents refinishing furniture and finishing wood crafts all the time. But i have jus recently taken an interest, it is just a hobby for me. Would like to know what you think. Hi there Barbara…welcome to an addictive hobby! 😉 I don’t use an expensive spray-gun to spray my pieces (it’s a Husky HVLP Spray Gun which retails for around $50) but the compressor was a large investment of $450+. If you’re just starting to refinish/paint furniture as a hobby, I would suggest keeping your costs as low as possible and buy supplies as you learn and grow. Hi! I just spray painted some old dining room chairs a slate grey color with some DIY chalk paint. Turned out awesome! Goes on super-smooth and very quick. I do recommend doing this in a place where you don’t mind getting paint dust EVERYWHERE. And, definitely wear a mask. The paint gun would get clogged every now and again, but I just used a wet paper towel to wipe it clean. Worked like a charm! How exciting! 🙂 I still haven’t tried shooting HMCP through my spray-gun but your comment is encouraging! Was the DIY chalkpaint difficult to clean out of the gun? And may I ask what HMCP recipe you used Shannon? Hey Shannon, I am interested in your recipe for HMCP too!! I too am also curious which HMCP recipe you used. I tried spraying with one the other day and the gun clogged more than it sprayed : kind of discouraging. I would hate to waste the can of this paint when it is so expensive! I’ve used a Wagner Optimus Power Painter 5.4 and didn’t have much luck Ann. You can read my full review here~ https://salvagedinspirations.com/review-wagner-optimus-power-painter/. I believe the 5.4 is an earlier version of the 6-6 EZ Tilt so there’s a good possibility that yours is the new-and-improved version and you wouldn’t have any issues. If you shoot your chalk paint through it, I’d LOVE to hear how it works out for you. I just came across your blog through Pinterest and I was curious to know what kind of paint sprayer do you own? I’d love to purchase one but, I’m clueless about them, currently. I am looking to use it often and would like a professional sprayer. Any advice would be very appreciated! Thank you so much! Your work is awesome and I am glad I found your blog today! Have you tried your sprayer with any others chalks? I currently have Maison Blanche on hand and have tried it in an inexpensive sprayer, severely watered down with NO success. I so want to start spraying but was not sure of best apparatus without spending a fortune and not watering down my expensive paint, having it not work and tossing it. I will check put the sprayer you recommend and the settings you use and give my MB a whirl! Hi Lisa! Sorry your watered down version didn’t work. I know how frustrating that must have been but give yourself BIG credit for trying!! I have only tried spraying with Annie Sloan CP. 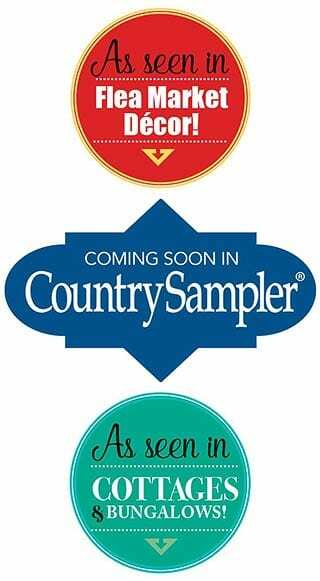 In the near future I’d love to try a few other name brands and HMCP to see how they compare. Must be my lucky day! I do believe in the saying, “there are no accidents” when it comes to meeting people of like minds. Although this being the first time I’ve ever heard of you, I can’t help the feeling that we may have crossed paths at one time or another. 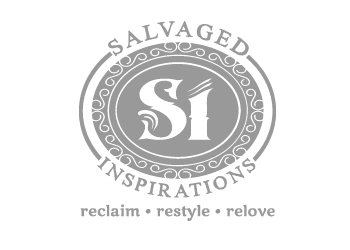 I came across your site while attempting to educate myself on this ever growing subject of chalk paint. I say my lucky day because of a couple of factors. #1.My wife has a bad case of”chalkpaintitus”. And #2. Paying upwards to $70 for a gallon of paint and a small jar of wax. Thanks to you’re generosity and willingness to share your experiences makes this hobby much more affordable. Thank you!! As for spraying, I’ve tried it a couple of times. I prefer spraying over brush work when possible. Maybe this suggestion will help you or someone interested in the spraying technique. I purchased a spray-gun from Harbor Freight for less than $10. Works great when I pour the paint through a paper strainer. And cleanup is a snap when the gun is washed ASAP after throwing on some paint. So, that’s all I have to offer at this point. And who knows if the rule of 6th degree actually places our ventures of chalk painting into our daily travels. Thanks again and keep up the terrific work! Maxxy, I also believe things happen/people meet for a reason… very nice to meet you! 🙂 Thanks for the tips and also the smile…”Chalkpaintitus”… I think your wife and I would get along famously..lol! I’ve used ASCP in my sprayer once but had to water it down. I’m going to try adjusting the settings like you suggested and give it another whirl. The ONLY reason I haven’t used the sprayer regularly was the clean up….it took over an hour! By the time I’m done painting I don’t want to spend so much time cleaning up, normally I just throw my brushes in a cup to soak and head to the shower. I’m going to try a diy chalk paint now that I’ve read your article! Thanks for posting!! Oh Nikki…how interesting! What is “tye” plaster..is that Plaster of Paris? I have an old blender which I use to mix all my chalk paint recipes with but I just haven’t mustered up the courage or time to try a DIY recipes in my spray gun yet. I have to agree with you though, working with the sprayer was fun and quick! Thanks so much for sharing your results Nikki! Did you use the ascp wax? If so how did you apply it? Also, what sprayer do you have? Could you recommend one? Very informative, thanks for the information. Great post! Very informative! You did a fabulous job on the furniture! I can’t wait to try it! 🙂 Thanks! Have you considered trying to spray the homemade paint? I just purchased a paint sprayer but haven’t used it yet. Any recommendations as to the best paints to use? I think i might try the ASCP too. 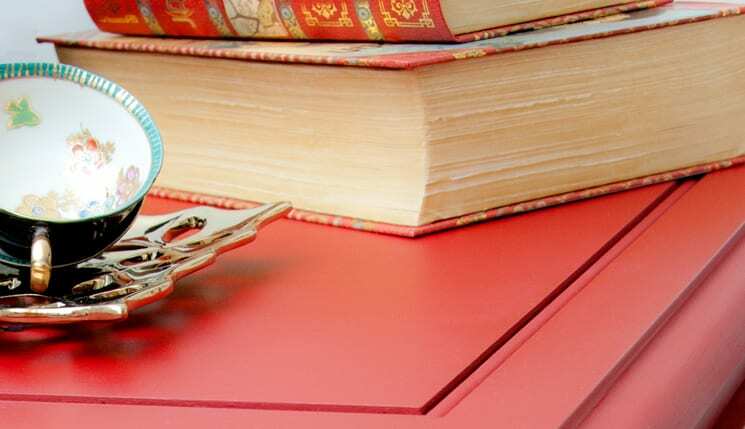 For furniture that will get considerable wear, I like spraying with Sherwin Williams All Surface Enamel. It’s durable and doesn’t even require a sealer/topcoat.My recommendation would be to choose a paint which is BEST for your PROJECT. With a little practice, your spray gun will provide professional results regardless of what paint you use! Have fun Anne! Is it possible to refinish a piece of furniture using a type of “regular” paint instead of chalk paint, without having to sand or prep first? If you’re referring to ‘regular’ water or oil based paint – not really Crystal. For the paint to adhere and stay on, prepping with a sanding and primer is beneficial. However, the good news is there are numerous paint products available if you’re not into the prep. Just google “no prep furniture paint” and a ton of results will come up! Wow, those look beautiful! When you use stain over your painted piece do you wax first or just wipe it on over dry paint? Thanks Stephanie! I wiped the stain over the dry chalk paint. Then as an added top coat, I waxed it. Excellent post!! What CFM @ what psi does your compressor work at? Hi Michelle (a lot of “Michelle’s” commenting today…lol) My compressor is 11-gallon(41.6L) CFM 6.2 @ 40 PSI and 5.2 @ 90 PSI. My spray gun sprays at 40 PSI. Oh Michelle…. I’m excited! PLEASE let me know how your DIY Chalk Paint sprays… I’m VERY curious!! Love your results! I’ve sprayed ASCP before and love the flawless finish. Great job, love your pictures! Did you use any of the recommended Annie Sloan clear wax prior to the ebony minwax? I want the exact color you got as an end result for my furniture make over! Hi Amanda! I did not use any wax prior to applying the ebony minwax. whew! Misery loves company…so happy to hear I wasn’t the only person CURSING up and down during the cleaning process :0) I thought for sure I was done for…hubs BEGGED me not to try spraying chalk paint and I’d have never heard the end of it had it not eventually worked out alright! I know who the adventurous one is in this family! LOL Thanks for the compliment and sharing Michele. I feel better knowing I’m not the only one who had a heck of a time cleaning my gun. Did you use paint thinners too clean it properly? I make a concious effort to ‘work-green’ and keep chemical use to a minimum, but in this case, I didn’t have much choice. Very well written!! You answered all my questions. The pictures really helped along with your very concise information!! Erin!!!!!! You encouraged the “magic” when I was in doubt! Absolutely perfect….Love the red! Two totally different looks from the same paint color! You are an inspiration and thank you for explaining your process. I LOVE being inspired and I LOVE being an inspiration…thanks so much Judy!